2011 was Barack Obama’s year of living dangerously. 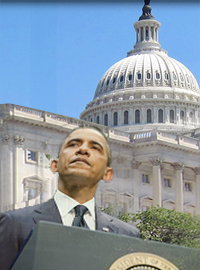 Whether it was the debt ceiling showdown, the prospect of closing the federal government or the push for a macroeconomically meaningless payroll tax cut, the president’s standard operating procedure was to wait until the eleventh hour, then hope that the resultant chaos in Congress would be sufficient to get the legislative branch to bend to his will. If a contempt for Congress was the hallmark of Obama’s lawmaking strategy in 2011, however, the president looks to be taking it one step further in 2012: ignoring the legislative branch outright. The predicate for this strategy was laid late last year, when the White House rolled out the "We Can’t Wait" campaign, a political maneuver designed to capitalize on Republican “intransigence” (read: garden-variety opposition) to the president’s agenda. Manning his old “fierce urgency of now” parapets, Obama responded with unilateral action in the form of administrative directives and executive orders. The resultant policies – all of which were disreputable and middling in equal measure – included spending $4 billion to improve energy efficiency in buildings, allocating $1 billion for a crony capitalist-style startup fund for small businesses and making it more expensive to hire in-home health care workers. On Wednesday, however, Obama made it clear that he would up the ante in 2012, announcing the recess appointments of Richard Cordray to head the Consumer Financial Protection Bureau and three new members to join the National Labor Relations Board. There’s only one problem: The Senate was not in recess, having met the day before. The president’s announcement amounts to a naked power grab. Republicans had long opposed the president’s nominees to both bodies because of the excessive power that the administration would exercise from within them. The NLRB already showed this tendency for intemperance last year when it attempted to prevent Boeing from creating new production jobs in the right-to-work state of South Carolina instead of union-dominated Washington (the NLRB dropped the case in December). The CFPB, a creation of the Dodd-Frank financial reform bill, would have unaccountable and virtually unlimited power to regulate an enormous variety of non-bank financial transactions, ranging from how consumers can pay bills over the phone to what kind of paperwork developers must give to prospective homebuyers. Republicans had sat on the nomination to head the CFPB primarily because they were waiting on changes to the law that would provide some measure of congressional oversight for this far-reaching authority. As disquieting as it is, expect this to be the template for 2012. Throughout the year, the President will pop up behind a microphone somewhere outside of Washington (it will always happen – by sheer coincidence – to be a swing state), announcing some bold (and legally dubious) action to override a recalcitrant Congress. This instinct is born from a belief that Americans are fed up with a legislative branch that won’t act. It ignores the countervailing possibility: that they’ve had it with a president whose hyperactivity is matched only by his imprudence.